It appears that Cornell’s fortunes to secure a Heptagonal Championship would rest on their throwers. Blessed with a versatile stable of talented throwers, they aim to score big in these four events. Harvard, Princeton and Penn have individuals that could provide large points, but lack the same depth as Cornell. 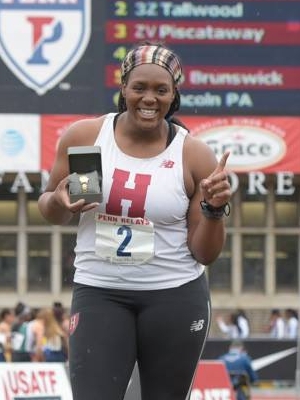 Harvard’s Nikki Okwelogu is the defending champion in the shot put and discus throw, along with being the Heps record holder in the former and #2 all-time in the latter. This year, the All-American has the #10 throw in the country in the shot put (56-03 3/4) and the #17 best in the discus throw (180-08 3/4). It seems likely that she will repeat this year and could break her own Heps records again. A trio of Cornell throwers, Leena Morris (#2 at 45-07), Taylor Drayton (#3 at 43-08) and Michaela Smith (#7 at 43-00 1/4) all have chances to score well in the shot put. Princeton’s Kennedy O’Dell and Taylor Morgan are legitimate scoring contenders, along with last year’s fourth place finisher Michelle Bazile (Brown). The discus throw has Camryn Goodman (Cornell) placing herself squarely in the runner up spot with a 151-06 throw this year. Her teammates of Taylor Baker (fifth last year) and Drayton are also able to score this year. 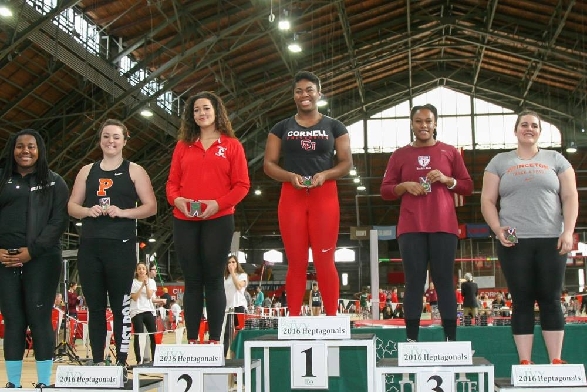 Nailah Hill (Penn) has the #3 throw this year (147-06 1/4) and should be considered for a top three placing, while Princeton’s Brielle Rowe and O’Dell have thrown well enough to deserve a scoring berth. Last year’s champion in the hammer throw, Julia Ratcliffe of Princeton, is not defending the title as she focuses on preparation for the Rio Olympics. This leaves the competition wide open as the top returner, Rowe, has the second farthest throw of the conference (173-07 3/4). O’Dell has the best throw this year at 181-07 and should be considered a favorite. Cornell’s duo of Baker (171-05) and Autumn Covington (165-00 1/2) should figure into the scoring, along with Bazile, who has the fourth best throw of the conference of 168-01 1/4. Rookie Rachel Wilson of Penn should also be one to watch to be a scoring contender. The two-time defending champ in the javelin, Kelsey Hay (Penn), looks to repeat again as Heptagonal Champion. It will be hard to beat the two-time all-American and conference record holder. Her teammates, Lisa Sesink-Clee and Serena Graf, finished fifth and fourth last year and are ranked #2 (150-04 1/2) and #4 (135-08 1/4) this year. This could be a huge point haul for Penn. Looking to break up this trio are Dartmouth’s Moriah Morton (third last year and ranked #3 this year) and Olivia Wiener, and Cornell’s Kacie Hargett. This entry was posted on Thursday, May 5th, 2016 at 3:00 pm. It is filed under Heps Champs, Spotlight, Team Previews, Women. You can follow any responses to this entry through the RSS 2.0 feed.